Hot Tub Super Bowl Party Time! The L.A. Rams are going to the Super Bowl and all of Southern California is gearing up to celebrate. This year bring the party outdoors and go the distance by hosting a big game day hot tub party that guests will be cheering about until next season’s opening-day kickoff. Don’t be caught off guard with unpleasant spa water on the day of the big game. Make sure the waters chemistry is balanced, that the filters are cleaned, and that it smells nice. If you want your guest to spend time in the hot tub and not over-heat, be sure to set the temperature for no higher than 102. If you don’t have the optional T.V. with your hot tub, that’s okay. As long as it is not raining, just bring your indoor T.V. outside for the day. Just be sure to place it on a sturdy table that is no closer than 10 feet from the hot tub, and that the electrical cords are not laying on the ground and at risk of getting wet. Also, you will want to make sure that when viewing the T.V. you are not looking directly into the sun. For drinks we suggest bottled water, juice and sodas. But if you can’t have a party without alcohol, stick to light beers or wine coolers. Stay away from hard alcohol and wine because when you are sitting in hot water your metabolism increases and effects of alcohol are felt much quicker. Keep all glass bottles away from the spa area. Keep the snacks on the lighter side and stay away from rich and heavy foods. The buoyancy of the water, and a full tummy are not a good combination. Vegetable platter and dip, fruit on skewers, chicken or shrimp kabobs, spring and egg rolls are just a few good examples. Another great snack you may want to consider is buffalo cauliflower bites. Check out how to make them in this video. Be sure to have plenty of towels on hand for your guest to use. You can never have too many. With guests getting in and out of the hot tub frequently, their towels will likely become damp and heavy pretty quickly. Turn on the outdoor fireplace and market lights. Place a table next to the hot tub and decorate in your team colors before placing out the snacks and refreshments. The Dollar Tree and 99 Cent stores are great places to pick up affordable party supplies in your favorite team colors. 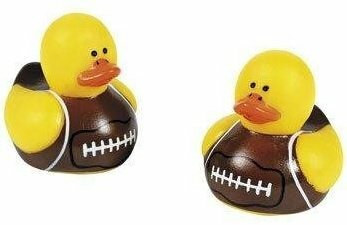 Turn on the spa lights to the color of your team to show your team’s spirit, and don’t forget to get some football rubber ducky’s and a nerf football or two! 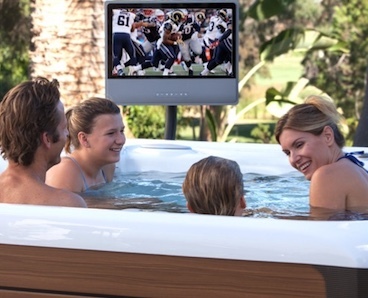 Make the most of your Hot Tub Super Bowl party with the right accessories. Music can help set the mood before and after the big game. Do you have steps for getting in and out easily? What about towel racks and safety rails? There are a variety of spa accessories you may also want to consider to bring your party to the next level. Call Coastal Spa and Patio at (714) 693-3404 for ideas and to learn about the latest hot tub accessories. Being the host of a party can sometimes be a stressful thing. But when you host a party in your hot tub, you can’t help but let go of the stress, relax, and have a good time. Let us know below if you have any football hot tub viewing party ideas! Happy hot tubbing and GO RAMS!! !